Although most patients are able to remove their own contact lenses, proficiency in contact lens removal is a useful skill for any clinician. Patients may present to the emergency department because of difficulty removing their own lenses or with acute ophthalmological complications of contact lens wear. Consideration should also be given as to whether patients with altered mental status (eg, comatose) may be wearing contact lenses. Prolonged contact lens wearing times are associated with an increased risk of corneal hypoxia and edema, infection, and corneal vascularization. Contact lens removal is also necessary following ocular trauma; however, in severe trauma, where globe rupture is suspected, an ophthalmologist should be involved before any ophthalmic intervention. These lenses are made from oxygen-permeable material. They are larger than rigid lenses but are more comfortable to wear and, therefore, are better tolerated. They may be worn monthly, continuously, or on a daily disposable basis. Daily-wear contact lenses: These lenses are not suitable for wear while asleep and need to be cleaned carefully and stored. Extended-wear contact lenses: Superpermeable silicone hydrogel lenses may be worn up to 30 days continuously, even while asleep. RGP lenses are made of plastic materials that do not contain water. The most popular material for their manufacture is fluorosilicone acrylate. The rigidity of hard lenses means they are generally easier to handle than soft contact lenses. The typical RGP lens diameter is 9.8 mm (the typical soft lens diameter is13.8 mm). Rigid lenses cover only 50% of the area covered by a soft contact lens and are smaller than the cornea. RGPs are more mobile on the eye than are soft contact lenses; therefore, they allow increased tear circulation beneath the lens. Increased tear circulation allows the transfer of more oxygen to the corneal surface. Generally, no contraindications exist to the removal of a contact lens from the eye. Caution is advised if the patient is uncooperative (eg, intoxicated). 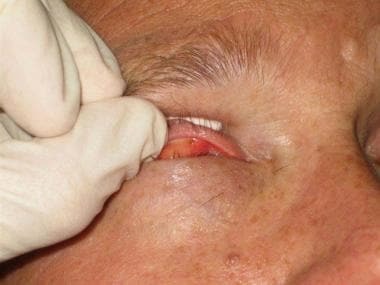 If the patient has had a serious eye injury while wearing a contact lens and globe perforation is suspected, removal should not be attempted; the patient should be referred to an ophthalmologist instead. An eye shield (not a pad) should be placed over the eye to minimize or avoid pressure on the globe. Anesthetic drops are typically not needed. A topical anesthetic ophthalmic solution (eg, proparacaine 0.5% [Alcaine, Ophthetic]) may facilitate contact lens removal in some cases. The patient may be seated or supine. Before starting, the clinician should wash his or her hands. The procedure may be performed wearing powderless gloves or with clean hands. Ask the patient whether he or she wears hard or soft contact lenses. Rigid gas-permeable (RGP) lenses are smaller in diameter (smaller diameter than the cornea) than soft contact lenses. RGP lenses are more difficult to remove than soft contact lenses because they do not fold. If the patient wears soft contact lenses, add a few drops of saline solution to each eye 5-10 minutes before removal. This hydrates the soft lens, making removal easier. While waiting for the lenses to hydrate, prepare the equipment needed for lens removal. Label 2 small cups left and right and fill each with enough saline to cover the lenses. Now examine the eye with a torch, ophthalmoscope, or slit lamp, as shown below. Positioning at the slit lamp. Ensure the contact lens is on the cornea before attempting to remove it. Attempting to remove a contact lens that is not there may result in a corneal abrasion. The contact lens should be centered on the cornea. If it is not, the lens can be moved gently into the correct position by a fingertip. If the lens is not visible in the eye, it may have become displaced (most commonly, under the upper eyelid). As depicted in the image below, the upper lid should be everted and the fornix examined. Eversion of the upper eyelid. To evert the lid, ask the patient to look down. Place the tip of a cotton-tipped applicator on the upper lid, 1 cm above the lid margin. This is the upper edge of the tarsal plate. 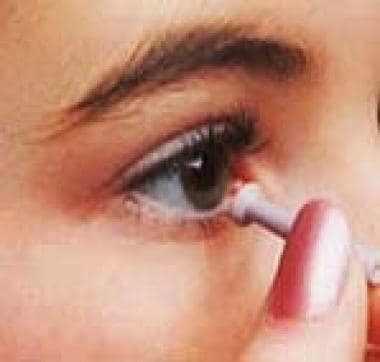 Grasp the lid margin and lashes with the forefinger and thumb of the other hand then evert the lid using the tip of the cotton applicator as a fulcrum. If the lens still is not visible, it probably already fell out. The lens is easier to identify if fluorescein eye drops are instilled, as shown below. Fluorescein drops permanently stain soft contact lenses. This should be explained to the patient before proceeding. Fluorescein may be instilled using a floret or with drops. 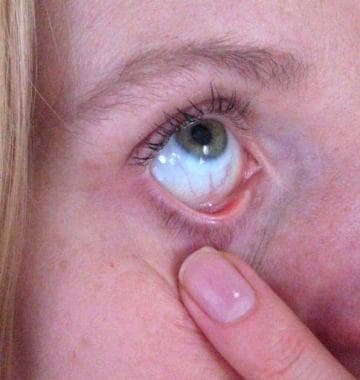 If using a floret, add 2 drops of saline to the tip of the floret, shake it to remove excess liquid, then lightly touch the flat side of the floret to the lower palpebral conjunctival surface. Make sure the lens is centered correctly on the eye, as depicted below. Make sure the lens is centered correctly on the eye. Hold down the lower lid while having the patient look up. Hold the lower lid down throughout the procedure, as shown in the image below. Hold down the lower lid. 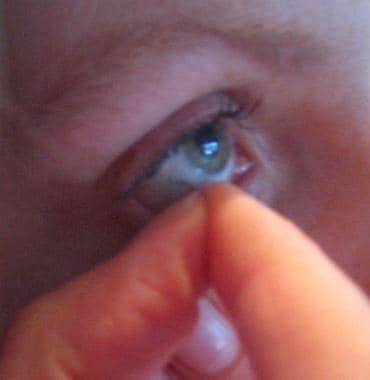 As shown below, gently touch an index finger to the center-to-lower surface of the contact lens. 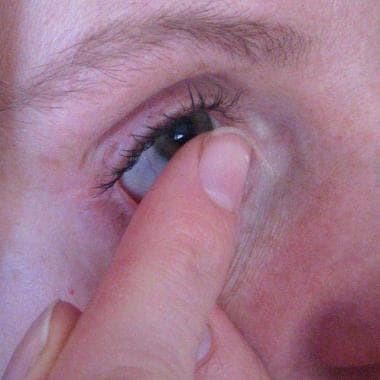 Touch the surface of the contact lens with an index finger. Slowly slide the lens down onto the sclera. Be careful not to release the lens at this point, as it will slide back to the center of the cornea. Gently pinch the lens between the thumb and index finger as shown below. Gently pinch the lens between the thumb and index finger. Pull the lens away from the eye, as shown below. Pull the lens away from the eye. 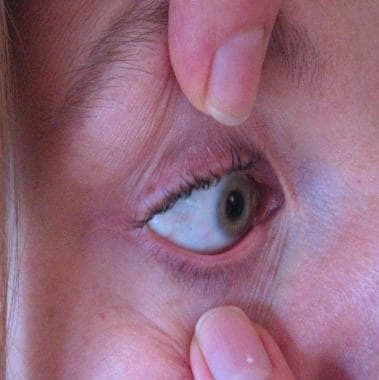 Place a finger on the lateral edge of the upper eyelid and pull the skin further laterally. 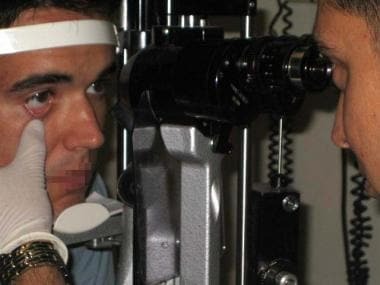 Ask the patient to look down and toward his or her nose; the lens should be forced of off the cornea. If removal of the lens is problematic, commercially available miniature suction cup plungers can aid the removal of hard contact lenses, as shown below. This device cannot be used for soft contact lenses. Miniature suction cup for removal of rigid gas permeable contact lenses. Moisten the suction cup with saline, then gently touch it square to center of the contact lens. The contact lens adheres to the cup and comes away from the eye. Remove the lens from the suction cup by sliding it gently sideways. Place a towel under the eye to catch the contact lens. Place a forefinger on the center of the upper lid and a thumb on the center of the lower lid. Press thumb and forefinger together to force a blink. The contact lens should fall onto the towel or hand. The technique may be performed using the slit lamp or with the naked eye. Place a cotton applicator tip on the lower part of the lens and slide the lens down onto the sclera. Gently press the cotton applicator under the edge of the contact lens and use the applicator to lift the lens from the sclera. If the contact lens is difficult to remove or an eye injury is suspected, the lens should be removed under direct visualization at the slit lamp. Instill topical anesthetics, if needed. Remove the lens using a pair of plain microforceps. A contact lens cannot become lost in the eye because the scleral conjunctiva is contiguous with the palpebral conjunctiva. If the lens is not visible, it probably is underneath the upper eyelid or has already fallen out. The main risk of contact lens removal is corneal abrasion. The risks of corneal abrasion can be minimized by ensuring that the contact lens is centered on the cornea, by hydrating a soft lens at the start of the procedure, and by following one of the methods described above. If difficulties are encountered, removal using microforceps and the slit lamp is advisable. More significant complications are likely to result from contact lenses left in the eyes for prolonged periods. This is especially important to exclude in patients with a reduced level of consciousness. 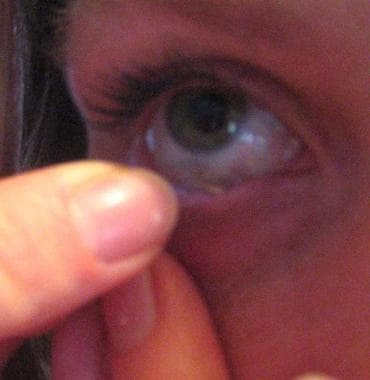 Complications of contact lens wear include lens deposits, allergic conjunctivitis, giant papillary conjunctivitis, peripheral corneal infiltrates, microbial keratitis, and corneal neovascularization. All types of contact lenses reduce the amount of oxygen that reaches the cornea. Oxygenation is reduced further if contact lenses are worn when the eyes are closed. Morgan PB. Trends in UK contact lens prescribing 2007. Optician. 2007. 16-7. Morgan PB, Efron N. A decade of contact lens prescribing trends in the United Kingdom (1996-2005). Cont Lens Anterior Eye. 2006 May. 29(2):59-68. [Medline]. Morgan PB, Efron N. Trends in UK contact lens prescribing 2006. Optician. 2006. 231: 16-7. Stapleton F, Dart J, Minassian D. Nonulcerative complications of contact lens wear. Relative risks for different lens types. Arch Ophthalmol. 1992 Nov. 110(11):1601-6. [Medline]. Babineau MR, Sanchez LD. Ophthalmologic procedures in the emergency department. Emerg Med Clin North Am. 2008 Feb. 26(1):17-34. [Medline]. Roberts JR, Hedges RJ. Ophthalmologic procedures. Clinical Procedures in Emergency Medicine. 4th ed. Philadelphia, Pa: WB Saunders; 2004. 1089-118. Disclosure: Serve(d) as a director, officer, partner, employee, advisor, consultant or trustee for: Allergan; Novartis <br/>Serve(d) as a speaker or a member of a speakers bureau for: Allergan; Heidelberg Engineering; Alcon; Novartis .